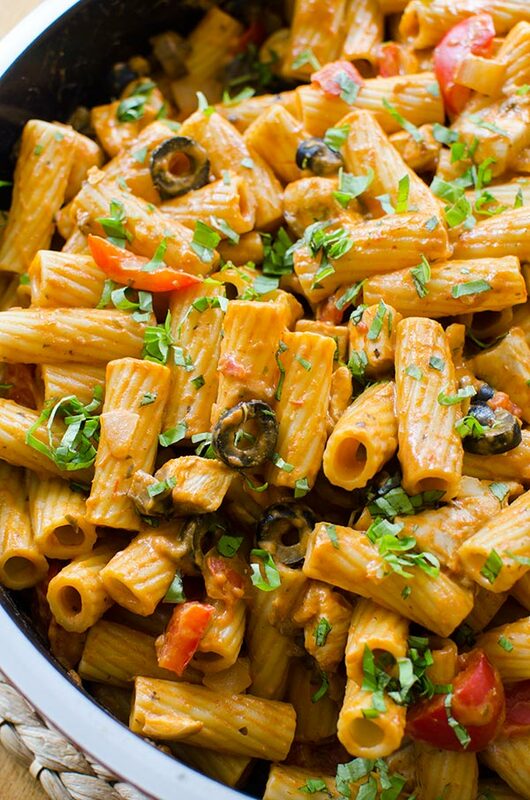 A delicious chicken rigatoni in a creamy tomato sauce with chicken, red peppers, mushrooms and olives. This is the second year that I haven’t actually gone back to school and had that familiar back-to-school rush. I definitely miss it. I always loved the beginning of a new school year, finding your classes, reading the syllabus and picking up textbooks, feeling your way around a new or familiar campus. Even though I’m not heading back to school this year or even next year (though I do want to go back at some point), I still feel that sense of renewal and rejuvenation come September. This time of year (and the coming months) is definitely the busiest time of the year and having quick weeknight dinners in my back pocket are one of the many keys to success (sleep is also one of those increasingly elusive keys). 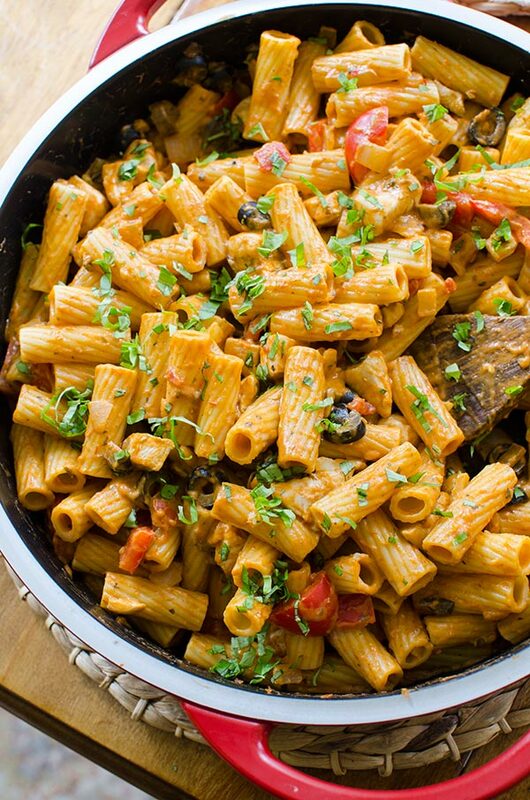 This chicken rigatoni recipe is without a doubt my new go-to weeknight dinner recipe, it’s loaded with fresh vegetables like bell pepper and portabella mushrooms with chicken and of course, olives. Because olives make everything better. The real secret to this chicken rigatoni recipe is in the sauce. As much as I love to make my own pasta sauce (my 20-minute marinara sauce is a favourite), I also don’t shy away from having a pantry stocked with store bought sauces because they can be lifesavers on busy weeknights, especially after working for 12 hours. I’ve always been a fan of CLASSICO line of sauces (the four-cheese has been a staple in my pantry) because I know these are a high-quality product that I can jazz up with fresh vegetables and herbs, making an almost 100% homemade dinner. Which if you ask me, is a pretty hefty accomplishment during busy times of year. For this chicken rigatoni recipe, I browsed through these CLASSICO recipes before landing on this chicken rigatoni recipe that seems like it was made for me, after all, rigatoni is without a doubt my favourite pasta shape. For this recipe, I’m using the brand new CLASSICO di Molise Spicy Tomato & Parmesan Cream Pasta Sauce which has a hint of heat, but it’s nothing overpowering, just a little kick, but you could definitely replace this with another CLASSICO sauce (did I mention that I love the four cheese? Yes, that would be A+ in this recipe). I didn’t really change much in this recipe, in fact, other than using the new sauce, I switched out the mascarpone and added sour cream instead. The sour cream still gives the sauce a creaminess and it’s also a lot more budget-friendly than mascarpone (a tub of mascarpone is over $10 at my local grocery store, no thank you!). Heat oil in large deep nonstick skillet on medium heat. Add chicken; cook 5 min. or until evenly browned, stirring frequently. Cook pasta as directed on package, omitting salt. Meanwhile, add onions, peppers and mushrooms to chicken; cook 3 to 5 min. or until chicken is done and vegetables are softened, stirring frequently and adding garlic for the last 2 min. Add pasta sauce to chicken mixture; stir. Simmer on medium-low heat 5 min. or until heated through, stirring occasionally. Add sour cream; cook and stir 1 min. or until blended. Remove from heat. Drain pasta. Add to chicken mixture along with the basil; mix lightly. Disclosure: This post was sponsored by KraftHeinz Canada – as always, all opinions are my own. Thank you for supporting my sponsors and allowing me to continue creating recipes like this chicken rigatoni recipe! A great looking simple pasta recipe. Sounds delicious too. I've done a similar dish with sun dried tomatoes. The rigatoni really catches all of the delicious sauce. Well done. Thanks Matt, love the idea of sun dried tomatoes, I'll have to try that next time!